Valley Mills to North Mountain (Marble mountain) Pioneer Road – This trail is actually the old pioneer road which crosses North Mountain (locally known as Marble Mountain) from Valley Mills to the community of Marble Mountain. Personally, this is one of our favourite hikes. Starting in Valley Mills (park at the side of the road) the first section of early succession growth quickly turns into a wonderful old forest (Eastern hemlock grove). Although there is no signage on this trail, it is easy to follow. Emerging from the oldest part of the forest, the vegetation gradually changes into a younger mixed wood forest. On the plateau the pioneer road gives way to a wide forestry road, again not signed, but following the map and heading south, then southeast, you will come down the mountain to the community of Marble Mountain. It is easier to follow the trail if you hike from Valley Mills to Marble Mountain rather than the other direction. The old hemlock / yellow birch forest is magical and home to a variety of lichens, mosses and ferns. Along the route you will see granitic outcrops as well as marbles and other metamorphic rocks. There will be wetlands to observe on the plateau and you will experience early forest succession where the forest has been cut in the past. Views of the Bras d’Or Lake and a multitude of islands are superb as you hike down the eastern side of the mountain; another reason for doing the hike in this direction. This hike is best accomplished with a vehicle at both ends of the trail so you can return to where you parked your car. So, make sure you hike this trail with several individuals unless you are equipped to walk back for a total of a 13 km hike! 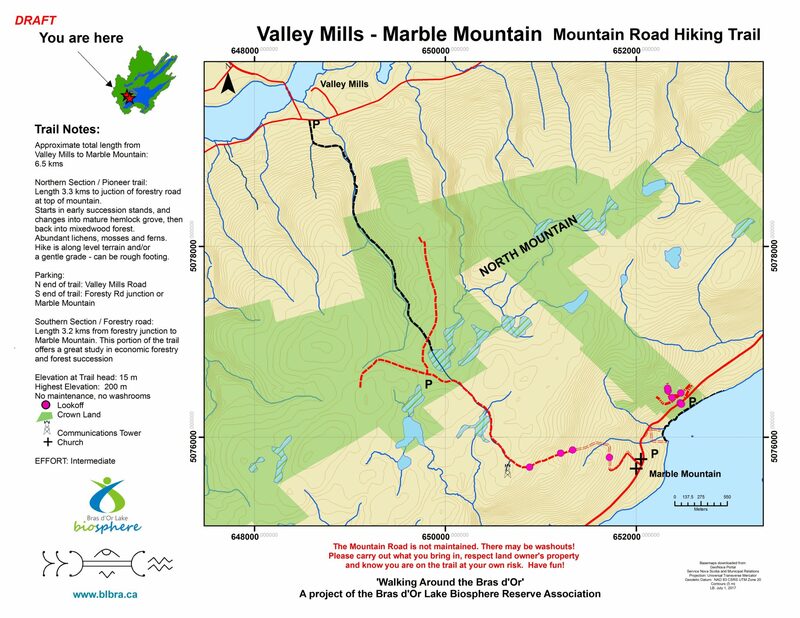 Click on Valley Mills to North Mountain (Marble Mountain) Pioneer Road to download the trail map.